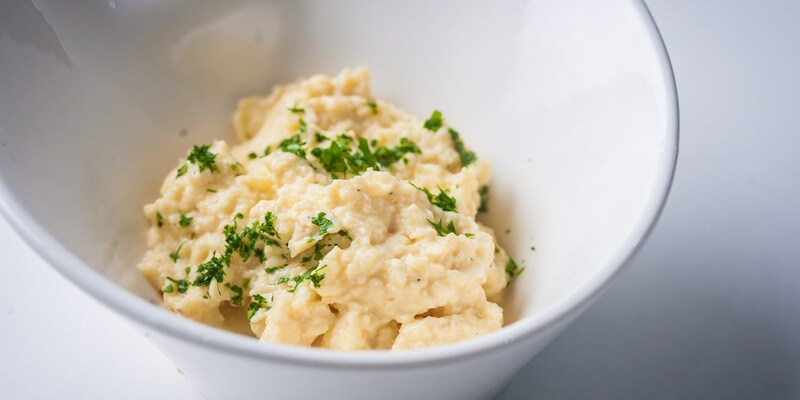 Scrambling eggs is not complicated but there are a few tricks for perfecting this mainstay of breakfast menus – fresh eggs, a light hand and good timing will guarantee perfect, creamy eggs every time. Allow two eggs and approximately 10g of butter per person. Once the eggs are cooked, fold in other ingredients – black pepper, chives, parsley, grated cheese or smoked salmon trimmings, for example. This method also works for duck and goose eggs. For breakfast, serve scrambled eggs on buttered toast with mushrooms as Shaun Rankin does or as part of a full English. Mark Dodson wraps his scrambled eggs with ham in potato pancakes for a crowd-pleasing kid’s tea while Dominic Chapman cures some Alaskan salmon to be served with his scrambled duck eggs. However, Gary Jones takes it to a whole new level with his recipe for Sea urchin with scrambled eggs and Ossetra caviar.